It surely can’t be a coincidence that my third straight year of visiting the Saturday of the Maverick festival would yet again be blessed with glorious sunshine especially in a summer littered with record rainfall. Perhaps it has something to do with the finest annual assembling of country, roots and Americana artists on UK soil that is somehow granted the privilege to perform in a perfect setting each year. So once those omnipresent rain clouds had cleared during the 175 mile drive to this tranquil Suffolk location, the stage was set for the relentless procession of high quality gifted musicians purveying the fruits of their creative craft. Circumstances dictate that only the Saturday of this festival can be attended, so for me this year there was sadly no Corb Lund or Emily Barker who no doubt gave fine performances during the Friday evening slots that launch the weekend. Also the opportunity for the Sunday morning chill out with the remaining artists participating in the closing gospel brunch is missed, but the soul of the festival resides in the 12 hours plus of pure entertainment that embraces the Saturday. Even then it is maybe next time for such acclaimed artists as Amelia Curran and Rose Cousins as well as the several other dedicated acts that committed no other indiscretion than having a schedule clash with another top class performer and that is always the downside to assembling such an impressive cast of participants. Most of the artists making the final cut of my extensive featured list had been witnessed live before but a festival would not be complete without that experience of elevating a first time seen artist into the upper echelons of your live appreciation list. Sarah MacDougall, the opening artist of this linear review, does not fall into this category as she gave a fine intimate performance at the Kitchen Garden Café in Birmingham a couple of years ago. On that occasion she was in collaboration with a fellow Canadian artist, but as this year was literally a whirlwind couple of days UK trip, she elected to play solo and used her 40 minute pre-noon Barn slot to play a series of songs from her most recent release ‘The Greatest Ones Alive’. Sarah’s brand of Canadian folk is inspired by a decision to seek a near isolated residence in the Yukon territory of her homeland and you get a sense of this environment with the songs selected for this set such as ‘Permafrost’ and ‘Cold Night’. The small lunch time gathering helped her along by accepting the invitation to participate in the chorus of ‘It’s a Storm?’, although the best song of the set ‘We’re All Gonna Blow Away’ also has sing-along credentials to its composition. The festival is centred on three stages with the accurately named Barn hosting acts throughout the duration of the day while the outdoor Maverick Stage shares billing with the Peacock Café following an early evening switchover. The outdoor stage was beginning to bathe in the most welcome afternoon sunshine by the time Cara Luft took to it with her newest musical collaborator, British artist Scott Poley. Cara was just coming to the end of an extensive UK tour promoting her new album ‘Darlingford’ and it was not surprising to see most of her set comprise of songs from this record. With festival appearances having a limited time allowance, alluring stories that accompany the songs of artists such as Cara are regrettably curtailed but the strength of tracks such as ‘Idaho’, ‘Only Love Can Save Me’ and ‘It’s Gonna Be Alright’ support their performance well. In line with the banjo workshop she was involved with later, Cara used the opportunity, as previously done in other gigs during the tour, to demonstrate her twist on rock classic ‘Sweet Child of Mine’ with this much maligned instrument. The mood and essence of Cara’s performance would have probably been more suited to the Barn but she signed off this UK visit leaving good memories after catching her live a couple of times over the last month. Amy Speace is not an artist who has come across my radar before but that situation was rectified following her mid afternoon slot in the Barn. Hailing from New Jersey but now residing like so many in Nashville, Amy is certainly slanting towards the folk side of the Americana spectrum and can number the legendary Judy Collins amongst her admirers. In fact a song featuring in Amy’s set, the impressive ‘Weight of the World’, gained further prominence by being covered by Collins who has taken a keen interest in her career. Like so many artists on view, Amy is in the UK to promote a new album and used her set to preview a couple of songs from the upcoming release ‘Land Like a Bird’ including ‘Ghost’ and ‘Vertigo’. Amy uses her natural charm to portray the model of a folk-inspired singer-songwriter and she recalled a tale of spending hours with other artists at festivals across the U.S before launching into ‘It’s Too Late To Call It a Night’, a song written with Jonathan Byrd who visits this country for an appearance at the Shrewsbury Folk Festival later in the summer. She’s spending most of July in this country opening for Alejandro Escovedo and is definitely an artist to explore further. Maverick is not just a vehicle for travelling American and Canadian musicians to highlight their talent; it is also very serious about promoting a select band of UK acts that provide a British slant to this type of music. The four piece band Hatful of Rain specialise in old time music with a blend of British folk and Appalachian bluegrass and having recently discovered their debut album, catching the band’s afternoon set was earmarked as a priority once the schedule was announced. In true old time style the band delivered a storming mix of self-penned and traditional tunes with the shared vocal duties of Chloe Overton and Phil Jones perfectly complementing the delightful sounds emanating from their array of string-based acoustic instruments. Most of the songs came from the recently released debut album ‘Way Up On The Hill’ with Chloe’s vocals featuring prominently on the emotive title track and Phil stepping to the fore to deliver the infectious upbeat reflective number ‘Rockin’ Chair Daddy’. The combination of cleverly constructed songs and toe-tapping fiddle tunes saw Hatful of Rain meet the high expectations derived from their new recording and they should really aim to take these songs around the country to a greater audience. You never know, we might get the chance to hear their version of Gillian Welch’s ‘Caleb Meyer’, a song beaten by time on this appearance. During this very busy day, two established artists were only afforded partial set visits but this is by no means a slur on their performances just the constraints of fitting 24 hours of music into 12 hours. Jason Ringenberg was one of the pioneers of alt-country in the mid 80’s and on this solo UK visit he likes to mix rock ‘n roll stories, Hank Williams’ covers and taking audience requests for old Scorchers numbers, a band he is bringing back to this country in October. Similarly to Ringenberg, Michael Weston King has been making good quality music for many years and is currently receiving well deserved recognition for his My Darling Clementine project where along with his wife, Lou Dalgleish, he celebrates the iconic days of some of country music’s great male-female duets. This full band show entertained those present and is something to try and catch during its numerous performances up and down the country. The final two acts performing on the outdoor stage, which closes prematurely at 6-30, were watched in their entirety. First up was four piece Canadian band, Ladies of the Canyon, who were virtually parachuted into this country from a European tour and used this flying UK visit to test the market. The four female members delivered their brand of easy listening light country rock via a couple of acoustic guitars, double bass and tambourine creating a sound that captures the mood of the origins of their name, the iconic Joni Mitchell album and its connotation of 70’s California. Apart from the explicit revenge song ‘Billy Blasko’, the most memorable moment from the band’s set was their version of the Robbie Robertson song, ‘The Night They Drove Old Dixie Down’, covered by amongst others, The Band and Joan Baez. In contrast to the Ladies of the Canyon, the eagerly awaited re-appearance of Eve Selis accompanied on this tour by her six-piece band brought the afternoon to a fitting climax with a vibrant set of country fuelled roadhouse blues rock. Flanked by two expert guitarists in Cactus Jim and Marc Twang, Maverick and UK regular Eve uses her effervescent charisma to deliver a strong hour-long set of tracks from her new album ‘Family Tree’ sprinkled with some old favourites and a familiar cover with added relevance. ‘Folsom Prison Blues’ is hardly the most original Cash song to play but when Cactus Jim, with four years experience of touring with the Man in Black, takes control you can hardly fail to be impressed. Marc Twang, Eve’s long time and usual musical partner, was not to be outdone with some skilful slide guitar work on ‘Water Off a Duck’s Back’ from the new album which is probably their finest work to date. You could almost sense a guitar duel taking place of which the enthralled crowd were not going to complain, although there was time for accordion player Sharon White to add value to the old favourite ghost tale ‘The Ballad of Kate Morgan’. This performance, ultimately the highlight of the day, was a taste of what we are likely to expect as the band proceed through their two-week UK tour. As the evening activity moved to the delightfully titled Peacock Café, with its beautifully designed artist backdrop, there was time for one more visit to the Barn to catch the performance from the fiddle playing singer-songwriter Texan Carrie Rodriguez who is currently working alongside guitarist Luke Jacobs. This young lady has to be one of the most talented musicians on the Americana circuit and she did not disappoint those present with a combination of new and old songs that has seen her skills harnessed by some of the industry’s respected figures such as Chip Taylor and Mary Gauthier. From her 'Seven Angels on a Bicycle' album she played the title track, ‘I Don’t Want To Play House Anymore’, ‘50’s French Movie’ and ‘Got Your Name On It’, while from her new album due to be released later this year, ‘Lake Harriet’ came over as a really strong track. Excuse the pun but while playing’ second fiddle’ to Carrie, Luke Jacobs supported her well with both acoustic and lap steel guitar. The new album is definitely one to look forward to as well as Carrie’s continued commitment to promote her music in the UK. More time has been spent in the Peacock Café on previous Maverick visits but this year only two artists were witnessed, although when you are in the presence of the contrasting styles of Otis Gibbs and Gretchen Peters for nearly two hours you know the festival organisers are doing something right. The reputation of Otis Gibbs as the epitome of the travelling American folk singer continues to grow as he undertakes his annual extensive jaunt around theses isles leaving memories of real life tales recounted in the spoken and sung word sealed with his humble signature of ‘thanks for giving a damn.’ As usual he opens with ‘Small Town Saturday Night’ and closes with the spine tingling ‘Karluv Most’ the Czech name for Prague’s landmark Charles Bridge. In between Otis pays tribute to a late friend in 'Something More' and introduces the audience to a couple of songs from his new album ‘Harder Than Hammered Hell’. As he left the packed Peacock Café stage to a rousing applause, this was not to be the end of his night’s work. 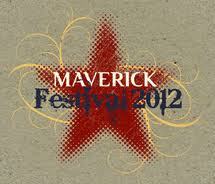 Unlike many other festivals, the Maverick doesn’t really have a headline act, summing up the egalitarian nature of the artists invited, but highly respected Nashville based singer-songwriter Gretchen Peters appeared at the top of the promotional information and was selected to close proceedings in the Peacock Café around 10.30. This second 2012 visit to the UK with husband and co-performer Barry Walsh followed a highly successful spring tour promoting her critically acclaimed album ‘Hello Cruel World’ and is designed to bring her work to a wider audience through a string of festival appearances. With a set containing many of the masterful songs from this album such as ‘Woman on the Wheel’, ‘Matador’, ‘Five Minutes’ and ‘Idlewild’ , a fair number of the audience were already familiar with these songs and long standing admirers were treated to a version of, what is considered her UK signature tune, ‘On a Bus to St. Cloud’. Although the tight schedule restricted encores during the day, Gretchen’s enthusiastic audience were treated to one more number with a song which is becoming a feature of both her own and ‘Wine, Women and Song’ shows , a rendition of ‘Wild Horses’ by the Rolling Stones ably assisted on partial duet by the invited return to the stage of Otis Gibbs. Spring 2013 tour dates are already announced by Gretchen and we eagerly await her next career development. With the closing of the Peacock Café, it was just left to the Barn to bring the whole successful day to its conclusion with a blistering performance from Austin royalty and long time alt-country legend Alejandro Escevado and his band the Sensitive Boys. Without being too familiar with his body of work, the let your hair down rock-infused sound certainly raised his profile within my sphere of awareness and impressive tracks such as ‘Bottom of the World’ written about the live music capital of the world – Austin, Texas, and ‘San Antonio Rain’ created a desire to further seek out his material. This includes an imminent album release called ‘Big Station’ of which the title track was included in the set. As the band came to the end of their encore cover of the Rolling Stones ‘Beast of Burden’, the time had come to leave Maverick 2012 and hope that the apparent success of the festival is matched by the all important financial reckoning. The attendance seemed in line with previous years and with the added proof that the sun does shine on Maverick Saturday, surely the scene is set for a re-staging of the day when country, roots and Americana assembles in a small farm in Suffolk.